This article is about the Ranked Battle mode. For the weapon of the same name, see Rainmaker (weapon). For the shield that must be burst to obtain it, see Rainmaker shield. Rainmaker is one of the four Ranked Battle modes in Splatoon and Splatoon 2, alongside Splat Zones, Tower Control and Clam Blitz. Rainmaker was the third Ranked Battle mode introduced in the series, and the last mode introduced in Splatoon. Rainmaker was first announced in the Splatoon Direct on 7 May 2015. However, its description was extremely vague and only a picture of the Rainmaker itself was released. 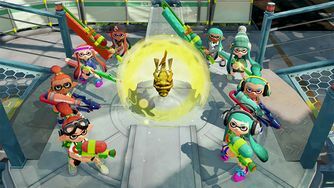 The weapon was later shown in action in a Japanese Splatoon commercial that was released in late July 2015. A few months before the mode was released; a general gameplay description for it was leaked on Twitter. Rainmaker was then released on 14 August 2015. Clips of Rainmaker from Splatoon 2. Rainmaker was first confirmed to return for Splatoon 2 on 2 June 2017 in a Nintendo YouTube video. 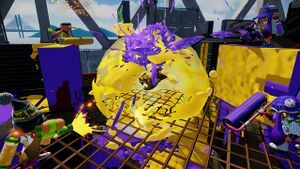 The Rainmaker was changed to fire a ball of ink rather than an ink tornado. A modified Rainmaker that does not explode after carrying it for too long is given by Sheldon during the final phase of the final boss. The Rainmaker is reset to the center of the stage after popping the shield and not picking it for fifteen seconds, it will not reset when is located at the center of the stage. 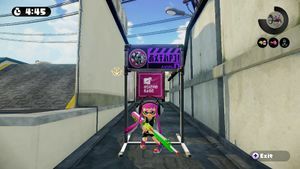 Rainmaker appears as a type of test that Agent 8 must pass to escape the Deepsea Metro; the Rainmaker has the Kamabo logo on it instead of the anchor logo of the standard ranked mode. The mode works the same as a regular Rainmaker match but Agent 8 is up against a team of Sanitized Octolings that can have main, sub, and special weapons like regular ranked matches. The Rainmaker appears on Agent 8's base and they have to carry it through the enemy's base by themselves and get it on the base. Unlike in multiplayer, the Rainmaker can be carried anywhere in the stage and does not automatically splat the user if held onto for too long. Additionally, the Sanitized Octolings will not attempt to take the Rainmaker themselves- if they break the Rainmaker's barrier, it will be reset to its start point. Rainmaker on the map, covered in a bubble shield. Rainmaker is similar to Tower Control in that it requires teams to move a certain object to a point in the other team's base. However, in Rainmaker, only one player may have control of the Rainmaker, and they themselves must control where it goes. The device is encased in a shield similar to a Zapfish's bubble in Octo Valley, and must be freed before it can be captured. If one team bursts the Rainmaker Shield, all Inklings of the other team caught in the blast radius are instantly splatted. Touching an intact shield causes a small amount of damage. The player who holds the Rainmaker must carry it to the goal in the other team's base within sixty seconds or the Rainmaker will explode, splat the carrier and every friendly player in the blast radius, and cover the ground with enemy ink. The marker displaying the time remaining will appear above the carrier's head. Retreating with the Rainmaker to the player's side of the stage past the enemy team's lowest goal distance will cause the Rainmaker explosion timer to tick faster than normal until the player returns to the enemy team's lowest goal distance. The Rainmaker explosion timer will also tick faster than normal when the carrier is in a prohibited area. In Splatoon 2, when the carrier of the Rainmaker explodes in their side of the stage, the Rainmaker will reset to the center of the stage. The Rainmaker itself is capable of shooting large twisters (in Splatoon) of ink, similarly to an Inkzooka, or bursts of ink (in Splatoon 2). The Rainmaker has similar attributes to a Charger-class weapon, due to it having a charge mechanic. The shots that it can fire range from a small twister or burst to a large tornado-like twister or big, explosive burst depending on the length of time that is held down by the player. At maximum charge, the shot is lethal, allowing the Rainmaker carrier to have a form of defense against enemy fire. The projectile in Splatoon 2 is fired in an arc, allowing its shots to hit enemies behind cover but making it much less effective in close quarters. The Rainmaker carrier should note that shots from the Rainmaker will not consume ink, and therefore they will not need to consider refilling their ink tank when defending or attacking. Because the Rainmaker is so heavy, the player holding it cannot Super Jump, nor can they use any of their sub or special weapons. The player's Movement Speed and Swim Speed are reduced by 20%, and speed increasing abilities affect the user normally no matter what weapon they were carrying prior. The Special Gauge does not charge while carrying it. If it is dropped, the Rainmaker shield will reform around it. It can then be recaptured by any player on both teams. If the player has the Rainmaker and splats themselves by falling off the map while behind the halfway point, the Rainmaker will reset its position by respawning in the center of the map. This will not happen when the player splats themselves by falling of the map over the halfway point and the Rainmaker will regenerate its shield where the player fell from. After firing a twister or burst of ink, the Rainmaker has knockback effect on the player. The pushback from firing the Rainmaker can be used to go through enemy ink reasonably quickly, so if the player is stopped without a chance of making a new path, firing the Rainmaker behind repeatedly can get the player a little extra push before being splatted. The player holding the Rainmaker has the ranked battle symbol marking them for everyone to see above their head alongside 60 seconds explosion timer, making them a huge target. The symbol can be seen on the map and even through walls when the player is in humanoid form. When swimming in ink in squid form, the ranked battle symbol will dissapear for the enemy team making it more difficult to spot the Rainmaker and an additional glow has been added where the carrier swims. The winning team loses control of the Rainmaker less than fifteen seconds before end. The losing team has ten seconds to pick up the Rainmaker after the winning team loses control of it. The losing team is in control of the Rainmaker. The winning team is in control of the Rainmaker. The winning team loses control of the Rainmaker more than fifteen seconds before end. The losing team was in control of the Rainmaker and loses control of it, less than fifteen seconds before end. The Rainmaker has not been touched for the whole match (in this case, the winning team is chosen randomly). The winning team gains control of the Rainmaker. The losing team loses control of the Rainmaker. The losing team carries the Rainmaker past the winning team's score, giving them the victory. The status of the Rainmaker's shield (popped or not) does not matter. Prohibited area in Flounder Heights. Prohibited areas are areas in certain stages that penalize the wielder for entering while carrying the Rainmaker. As the penalty, the Rainmaker explosion timer will tick faster, just like when retreating with the Rainmaker behind the enemy team's lowest goal distance. If the player runs out of time or gets splatted in the prohibited area, the Rainmaker will respawn in the center of the map. Stages in Splatoon that have prohibited areas are Walleye Warehouse, Saltspray Rig, Arowana Mall, Flounder Heights, and Piranha Pit. The prohibited areas in these stages are shown in the following overviews, indicated with the icon. 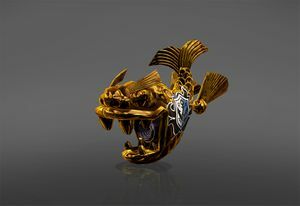 The Rainmaker weapon resembles an animal from Japanese folklore with the head of a tiger and the body of a carp with a nozzle in its mouth, known in Japan as a Shachihoko. Details of Rainmaker were datamined on 21 June 2015. Images of Rainmaker being played on an unnamed stage were revealed in the July 24th Japanese Splatoon trailer detailing future updates. The Rainmaker itself is the only weapon that cannot be bought or equipped. After sixty seconds, or when a player approaches their own base, the Rainmaker will explode and it will say "The Rainmaker Inksploded"(NA)[a]/"Splatted when the Rainmaker exploded!"(EU/OC)[b]. A player going towards their own Spawn Point with the Rainmaker brings up a "Warning! Don't Retreat!" message and causes the Rainmaker's explosion timer to decrease more quickly. They cannot enter their own Spawn Point, bouncing off the surrounding force field as if they were an enemy. If they get splatted while behind their team's goal, the Rainmaker will reappear at the center of the stage. When in motion, the Rainmaker carrier will be expressionless. When still, they make a big smile. Rainmaker bears a strong resemblance to Team Fortress 2's Capture the Flag mode, where a team needed to grab the objective from enemy's base and bring it to their base. However, in Splatoon they need to grab the objective in the middle and carry it to the enemy's base onto a goal. Some maps include a custom-version that functions identically to Capture The Flag, with a flag in the middle which needs to be carried to enemy's base. It bears an even stronger resemblance to Push from Team Fortress Classic, with the flag being in the middle of the map, and the objective being to bring it to a raised platform in the enemy's base. It is possible to get splatted by the Rainmaker Shield. This happens by an Inkling getting squished between the shield and a wall as the shield expands or when the explosion timer ticker runs out and the wielder and those in the player's team who are around the blast radius will get splatted. The Rainmaker's shield covered in Ink. An Inkling firing the Rainmaker. The holder of the Rainmaker under fire. An Inkling simply holding the Rainmaker. The Rainmaker about to fire. The player holding the Rainmaker firing in a ink-laden battlefield. An Inkling with a straight face while moving with the Rainmaker. An Inkling smiling while standing still with the Rainmaker. The Rainmaker firing an ink tornado. The ink tornado approaching its target. A teaser of the Rainmaker from the 5.7.2015 Splatoon Direct. Firing the Rainmaker at a angle. An Inkling holding the Rainmaker. Recieving the Rainmaker from Sheldon from Splatoon 2's final boss. The Rainmaker during Splatoon 2's final boss. This page has been accessed 76,270 times.